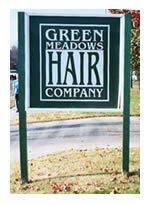 Directions and Hours of Green Meadows Hair salon in Columbia Missouri. Green Meadows Hair Co. & Spa will be closed on the following holidays: Memorial Day, 4th of July, Labor Day, Thanksgiving, Christmas, the day after Christmas and New Years Day. We close early on Christmas Eve and on New Year's Eve. Go South on Providence Rd. for 1.6 miles past the Stadium. Turn right at the second stoplight onto Green Meadows Rd. Look for the sign pictured above; turn right into our parking lot. Get off at the AC exit, turn onto Grindstone Pkwy, (If coming from 63N, turn right onto Grindstone Pkwy. If coming from 63S, turn left onto Grindstone Pkwy). At Providence Road, turn right. At Green Meadows Rd., turn left. Look for the sign pictured above; turn right into our parking lot. Get off on Stadium Blvd. exit and go South. Turn onto Forum Blvd. Turn left at Green Meadows Rd. Look for the sign pictured above; turn left into our parking lot before you get to the sign.